The Molecular Cytogenetics Group is in the University of Leicester, UK. Our telephone is +44/0 116 252 3397. Pat Heslop-Harrison is phh4(a)le.ac.uk or phh(a)molcyt.com +44/0 116 252 507Nine, mobile +44/0 794 603 450TWO (unreliable; send a text or e-mail, I rarely listen to answerphone messages); Trude Schwarzacher is TS32(a)le.ac.uk, +44/0 116 252 227Six. The direct lab. phone number is +44/0 116 252 3397. Visiting Address is Adrian Building, Department of Genetics and Genome Biology, University of Leicester, University Road, Leicester LE1 7RH UK. The entrance to the building (a big, white-tiled rectangular block from 1969) is on the opposite side from the road (unusually for a 60s/70s design, people are more important than cars!). Our lab. is room 201 on the road (green pointer on map above) side, above the enclosed pedestrian bridge that runs across University Road. Postal Address is Department of Genetics and Genome Biology, University of Leicester, University Road, Leicester LE1 7RH UK. Delivery Address is Entrance 3, Department of Genetics and Genome Biology, University of Leicester, University Road, Leicester LE1 7RH UK. (The group became part of the Genetics Department when the Biology Department was dissolved in August 2015; Genetics was then renamed Genetics and Genome Biology) Parking is difficult: the best is hoping to pay for a spot on University Road or in the car park off Granville Road, 5 min walk North. Some information about hotels and living in Leicester is linked here. 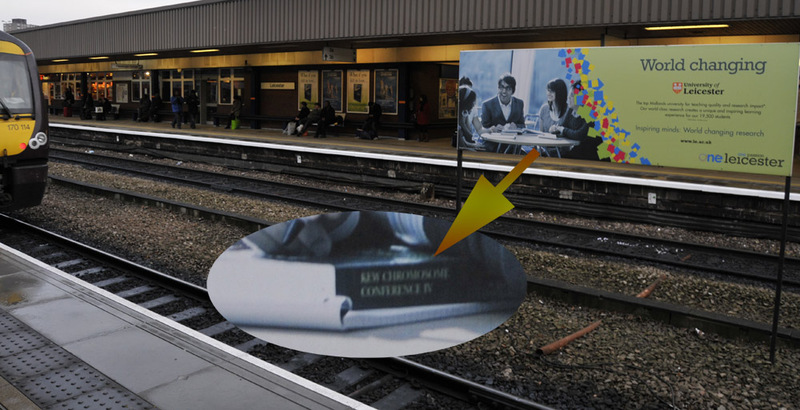 Leicester Railway Station: poster has students working with the “Kew Chromosome Conference” book we edited! To reach us by train, come to Leicester station, c. 1hr 10min from London with about three trains per hour. We are a 10 min walk (see map above: station is due South of our lab) or £5 taxi up from the station. Ask to be dropped off under the pedestrian bridge; do not go to either the University main entrance or Entrance 3. UK train fares are very high (>£1 per minute journey time at peak/non-prebooked times) and complex, ranging from £87 one-way, £95 from airports, to £15 return to Leicester from London St Pancras station. From Birmingham, trains take about 1hr and cost about £15 (same price either single or return). Train timetables can be accessed on line. The German railway site is useful since it allows you to print out intermediate station stops to follow your journey, especially helpful if the train is delayed. It is strongly recommended that you also find and know the final destination of your train: this will be on the signs at the station; finding the final destination usually means some rooting around on the websites (or the German site above)! Intercity buses are generally cheaper than trains and can be more convenient, particularly from Heathrow airport where your luggage is more secure than on the underground, and you do not need to change bus. When you get to the bus station, always go immediately to the bus departure point to find if the bus is leaving because timetables may not be followed, or drivers know the traffic lets them arrive on time with a 30 min delayed departure. The most convenient international airport for Leicester is Birmingham, UK (BHX). A PREBOOKED* taxi to Leicester takes 40 min costs c. £45 and is best after a long flight or essential between 9 pm and 8 am. Train takes c. 1 hr with one change and costs £15. 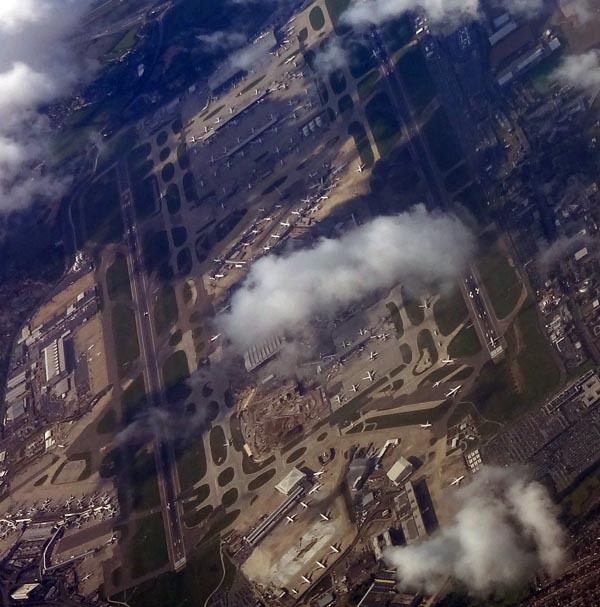 Flying from the East you go via Dubai and the West via Newark/New York, or through AMS or CDG. Flights are no longer slightly cheaper than via London (some, now mostly non-UK, travel agents/airlines will negotiate and undercut LHR fares). Birmingham check-in time is 1.5 to 2 hr; incoming baggage is slow, up to 1hr. For European flights, East Midlands (EMA) airport is about 25 min from Leicester (£20 PREBOOKED taxi, or bus every 1 hr). London Heathrow LHR and London Gatwick LGW are c. 2 hr by car or 3 hr by train from Leicester, with a substantial chance of taking 50% more time than this either by train or car. Both check in or baggage/immigration can take 2 to 2.5 hr. (Manchester, MAN, has some useful flights, eg from China, and is also 2 to 3hr from Leicester, train c. £55, and is a cleaner and less busy airport.) From Heathrow, bus is the cheapest and often convenient way to Leicester. Train means taking the underground to Kings Cross/St Pancras (direct underground train from LHR but many stops to watch your luggage – DO NOT take the so-called Heathrow Express which ends up in a different part of London), then changing to a mainline train to Leicester (see above). For the underground, a Chip-type credit/debit card is the most economical for paying: you scan the card when you enter the platform and then when you leave (cheaper and more convenient than buying a separate ticket). From Gatwick, train is very convenient: take a direct train from Gatwick Airport to St Pancras station (again, DO NOT take the Gatwick Express), then change for a train to Leicester which is basically two floors above the platform where you arrive from Gatwick. A PREBOOKED taxi from Heathrow or Gatwick (c. £150) is no more expensive than peak-train for 1 person, or peak for 2 people, or taking a hotel (for early/late flights when there is no public transport). Another emphasis: DO NOT take something called the Heathrow/Gatwick Express, whatever the information desk tells you (unless the underground is actually not running) – with the ‘Express’ you will arrive quickly in a remote part of the large city of London, and then need to take a complex and lengthy, underground to London-King’s Cross-St. Pancras Station to get to Leicester. Many European cheap flights go via London Stansted (STN) or London Luton (LTN), and sometimes the closest airport, East Midlands Airport (EMA). There are no trains before late morning so a bus, taxi, or hotel, is essential. Train to STN takes 2.5 to 3 hr, and to Luton Airport Parkway station c. 1hr (both are expensive depending on time, up to £55 one way, often more than the flight; PREBOOKED taxi is about £100). * Taxi prices are from a Leicester company, pre-booked in advance so they meet you outside the customs area. If not pre-booked, prices will be typically 4x those above, although if you can convince an Uber to take you long-distance, they will be about 2x the prebooked price. 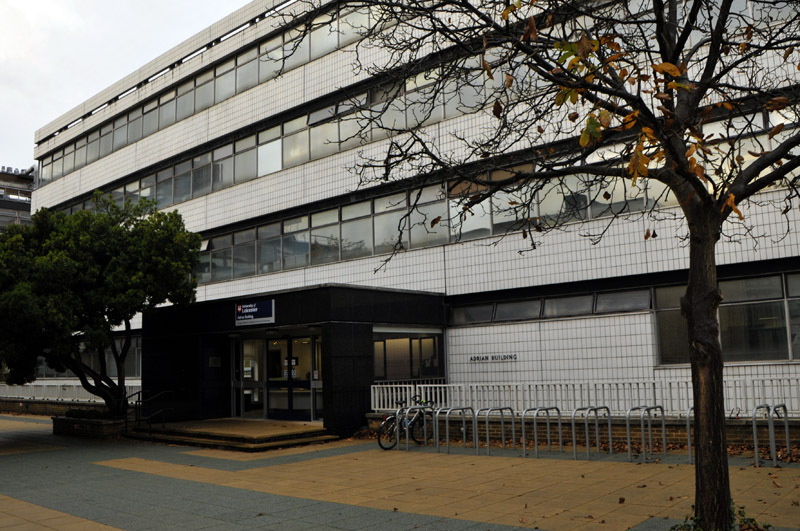 There is full disabled access to the Adrian Building, which has been improved considerably in the last three years. see http://www.disabledgo.com/en/access-guide/adrian-building/university-of-Leicester Thanks for your question.